This really is a breakthrough in the treatment of pigmentation, uneven skin tone, or just wanting to achieve brighter skin. This unique infusion that contains Neurolighta – a special Sand Lily extract that is proven to reduce melanin synthesis (this is responsible for pigmentation and age spots) and Vitamin C – encapsulated in specially formed sugar molecules in order to get the maximum power from the vitamin. Simply spray on the skin after cleansing and allow to sink in, then follow up with your favourite Crystal Clear moisturiser. 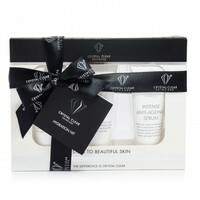 This amazing value pack also offers a saving of £13 on buying all 5 products separately.